I’m not in the habit of publishing reviews of new service or technology offerings that I observe in the marketplace, in large part because I remain stridently neutral. Plus the pace of change is so great that staying abreast of all the innovations would be a full-time commitment. However, I occasionally run across some new innovation that compels me to take note, and TCDI’s recent announcement regarding military spouses is deserving of attention. TCDI is a longtime provider of litigation management and eDiscovery software and services to the legal marketplace. In recent years, they’ve added managed services, notably document review, to their portfolio. While outsourcing document review shouldn’t still be considered innovative, it’s astonishing how many law firms or law departments continue to allocate high-cost strategic resources to a task that is ideal for an outsourced model. Attendees to Legal Lean Sigma and Project Management workshops will note that we regularly highlight service providers embracing Lean Six Sigma methodologies, and indeed an astonishing 70% of TCDI’s team is certified in these areas. Admittedly, however, I might not have taken note but for the appointment of my former colleagues Ginny Gonzalez and Michael Gibeault as, respectively, Chief Marketing & Business Development officer and Senior Director of Legal Services. 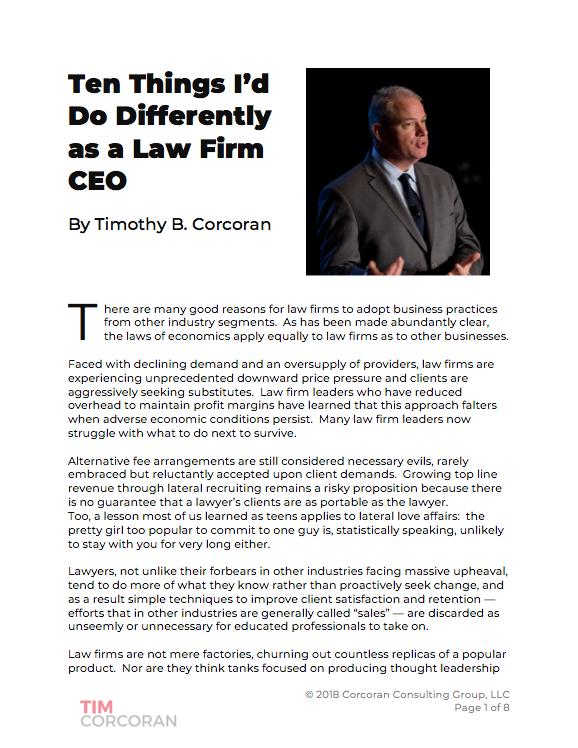 When a group of us old friends convened at a recent legal technology conference to share what we’re up to, Ginny’s and Michael’s enthusiasm suggested to me that a company bright enough to hire these rock stars is doing something right. My view was confirmed when TCDI recently announced a program to augment its managed review services by hiring military spouses with law degrees, otherwise known as experienced lawyers with excellent credentials whose mobile military lifestyle often deprives them of the opportunity to settle in at a law firm or law department. It appears to be a perfect solution for matching talented lawyers with a role that requires a combination of excellent legal acumen, flexibility, and significant project management experience – a trait inherent in every military family – for tasks that can be performed remotely at all hours with minimal supervision. It’s an ideal match even without the significant societal benefits of providing employment to a category of capable lawyers whose lifestyles result in higher than average unemployment and who are woefully lacking in opportunity, due to various state bar associations’ notoriously antiquated definitions of who’s qualified to practice law. My legal marketing friends will be pleased to note that TCDI encourages law firm clients participating in the military spouse program to promote their involvement in RFPs and pitches, and have provided a graphic for this purpose. I asked my friends to tell me something unique about TCDI unrelated to the military spouse program, and among the many examples they shared, the comment that resonated the most was an offhand remark by TCDI’s CEO, Bill Johnson, at a recent conference. When challenged why it takes a lawyer working remotely on average eight minutes to login to TCDI systems while competitors brag about login times of 30 seconds, Bill said “Because we’re serious about securing our clients’ data. If it takes a remote lawyer 30 seconds to log in, imagine how much easier it might be for hackers to gain access.” This is a company that gets it. You can learn more about TCDI’s military spouse program here or watch this short video. Feel free to contact my friend Michael Gibeault at +1.571.242.1081 or m_gibeault@tcdi.com for more information.